Adding a Service Learning component, or Community Project, as part of a school group adventure can range from renovating a school or constructing a water pipeline for a village to assisting in wildlife conservation. It is often this experience of ‘giving back’ that is the source of many students’ long lasting memories and life changing moments. But how can you be sure that this element of your school adventure is right? This post aims to outline the challenges involved with Service Learning work and what to look for when deciding which organisation will help both your students and the host community when researching your school’s next overseas Service Learning trip. Why do a Service Learning trip? The concept of combining travel with service isn’t new. In fact the blending of leisure and service has taken many forms throughout the decades, from experts in their fields, like medical and engineering specialists, offering their services in developing nations; to young adults assisting on conservation projects around the world during their GAP year; to school students benefitting from international exchanged programs. Today, this travel concept is commonly referred to as ‘Voluntourism” and it’s gaining momentum at a considerable rate. It’s no surprise that secondary school group travel has failed to escape the lure of Voluntourism, with a growing number of schools, both government and non-government, appreciating the value of incorporating a Service Learning aspect into their school group adventures program. Secondary students, in their formative years, have a lot to gain from a school group adventure, and equally from an adventure that includes volunteer time on a local Service Learning. Students return home with a greater tolerance for the differences in cultures; empathy for underprivileged people and a greater appreciation for their life back home; a better understanding of world geography and history; greater independence and an ability to operate outside of their comfort zone; a greater understanding of their physical abilities; knowledge about how the individual impacts on the environment as well as a deeper connection to nature. Along with all of these benefits, students come away with an intimate knowledge of the host culture having worked, played, eaten and celebrated with their host community over the time of the project. For real cultural immersion, Service Learnings cannot be overlooked. And for as little as US$1500 some of these projects can be achieved. Types of Service Learning trips a school can incorporate into their school adventure. Construction / maintenance: these projects can involve renovations to existing buildings such as classrooms and medical centers, building access to clean water or solar systems, or smaller building projects like building school desks or goal posts on a soccer field. These projects require the students to be physically fit and willing, since the work involved requires the students to exert themselves lifting and carrying. Additionally, many of the world’s most underprivileged communities are quite remote and difficult to access and so a 2-3 day trek to the village may be necessary. Sharing knowledge: these projects usually involve the students spending time at a school or orphanage exchanging language, games and cultural information. Conservation: these projects involve students working in wildlife sanctuaries and shelters, assisting with the animals’ daily needs, as well as working on scientific research projects collecting data on flora and fauna. How do you decide which type of project best suits your students? Choose to work with an experienced travel company that shows similar interests to that of your school, such as animal conservation, or humanitarian needs. How much of your itinerary do you want dedicated to Service Learning work? Some companies offer an even split, others make it a very small proportion of the itinerary, while other companies tailor-make itineraries to your specifications. Be realistic about your students’ physical and mental abilities in relation to the project and make sure that they match the components of the Service Learning. Enquire about the type and amount of support you will receive once you have booked the adventure and project. Will you receive pre-departure information and assistance to arrange all associated travel? Information about what shots and vaccinations might be needed? What about support during the trip and even afterward? Enquire whether the travel companies you are considering have International Public Liability Insurance. In the infrequent case of something going wrong, your school and parents will be comforted knowing that the travel company is covered by insurance. It should be noted that many travel companies do not have International Public Liability Insurance. Collect background information on the travel companies that you are considering. Check that they are a licenced travel agent and that they belong to professional tourism bodies. Ask whether they have had experience in coordinating and operating Service Learnings within your preferred destination. Ask about their successes, as well as some testimonials from students and teachers that have travelled with them in the past. Not all Service Learning trips are actually helping. Successes, you ask? Unfortunately, not all Service Learning trips can be referred to as successful – or helpful. All the best intentions can result in dissatisfied students and host communities. Sustainable and on-going. It’s important that sustainable projects are implemented, projects that not only provide immediate relief, but also seek to eliminate the cause, so that the host community can begin building a robust and self-sufficient society. For example, it is pointless and unsustainable to provide a community medical centre that the host community cannot afford to staff. The local partners of the travel company you choose to work with must have comprehensive discussions with the leaders of the community to identify the most needed project, that it’s long-term benefit is assured and to ensure that your school group won’t be leaving a problem behind them. This is where Service Learning work can go awfully wrong, when well-meaning but ignorant travel organisers decide on a project with little consultation with the host community. Focus on the host community. This is where Service Learning work can go awfully wrong, when well-meaning but ignorant travel organisers decide on a project with little consultation with the host community. It’s condescending to tell the local people what to do. 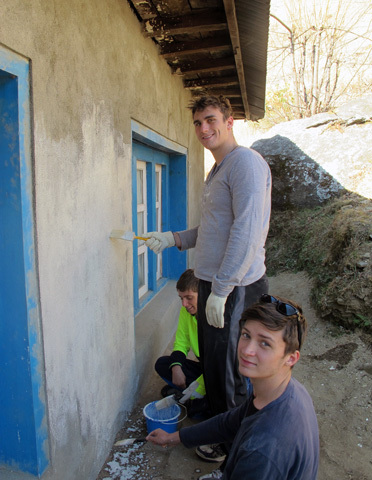 Rather school group Service Learning trips are there to supplement the efforts of the host community. The host community may be impoverished but that doesn’t mean that they do not have very smart ideas about how to assist their community. Constant and open consultation from beginning to end is essential. In relation to the project, priority is placed on the needs of the community, not those of the school group, in an effort to provide real benefit to the community. Shared experience. Service Learning work is at it’s richest when it is a shared experienced. The host community will tend to feel alienated and invaded if a group of students turn up one day and begin work painting their school for two days and then disappear. Service Learnings are a place for everyone to share their talents. Collaboration between students and their hosts will lead to wonderful cultural exchange and long-lasting friendships. Keep it local. Often a project will require the expertise of a specialist, like an electrician, builder, translator etc. In this case, local specialists should be employed to assist with the project, ensuring that the project is contributing also to the local economy. Respect and observe the customs and traditions of the local culture. Dress appropriately and be polite to members of the host community. All waste products are minimised (such as plastic water bottles) and unavoidable waste is disposed of in a responsible manner. Local staff are paid the award wage (or above) and treated respectfully by their employer. Carbon offset the accommodation and transport components of the itinerary ensuring that the unavoidable carbon produced by your travel is offset in a way that will help slow down global warming. Prior to leaving home students are educated about the endemic flora and fauna to ensure that they follow appropriate guidelines when they are near animals and plants. A Service Learning component of a school group adventure can be a wonderfully enriching experience and mutually beneficial exchange. It’s important for your school to do the necessary ‘homework’ to ensure that the travel outfit you use is well experienced in coordinating successful projects in the country your school is planning to travel in. Want to talk about a Service Learning trip for your school? Get in touch with a Youth Adventure Expert.